Every attempt was made to write the article below so that anyone with a basic general knowledge of chemistry could follow along. If anything is not clear please ask below. Two part epoxies work by combining an epoxy resin and a hardener in equal amounts. The “equal amounts” is important because the reaction between the two is one to one. The hardener does NOT work as a catalyst, but as a component of the reaction (it gets consumed in the reaction). The epoxy resin is composed of an epoxide functional group separated by a spacer (a bunch of atoms) and another epoxide. Interestingly, the word “epoxide” is where epoxy resin gets its name. An epoxide is a very reactive species that is composed of a three-membered ring (two CH2 and one oxygen). Epoxides are very reactive to nucleophiles which causes the ring to open. A nucleophile is an atom in a chemical that is rich in electron density and is attracted to positive charge. Nucleophiles (Nu) differ in their nucleophilic strength and examples include the oxygen atom of water, and nitrogen atoms of amines. And to take the strength point one step further, the nitrogens of different chemicals can also differ in nucleophilic strength. That is, not all chemicals that contain an amine have the same nucleophilic strength. The two dots (..) above the -Nu denote the unshared pair of electrons of the nucleophile and it is the unshared pair of electrons that “seek out” positive charge (there really isn’t any “seeking” per se – positive and negative charges attract each other and obey Coulomb’s law). In the figure below, the carbon adjacent to the oxygen has a partial positive charge because of the neighboring oxygen atom (inductive effect). Below is an example of an epoxide resin (A) with an epoxide functional group on either end (three membered ring). Epoxide resins can vary in structure and the differences will impact the epoxy’s properties such as strength, cure time and appearance. The structure of epoxy resins and their hardeners are often proprietary and covered by patents. The amine chemical above that is labeled “B” is the hardener in a two part epoxy. It usually contains a primary amine (-NH2) as the nucleophile (Nu). Primary amines will have a nitrogen atom and two hydrogens connected to them followed by a carbon chain (or singe carbon in the case of the primary amine methylamine – Breaking Bad anyone?). The hardener will often contain two nucleophiles per molecule (B has two primary amines). A hardener with two nucleophiles can cross link two molecules of resin (one nucleophile reacts with one epoxide per molecule). The product of the cross linking can continue with another molecule of B because it has available epoxides remaining. 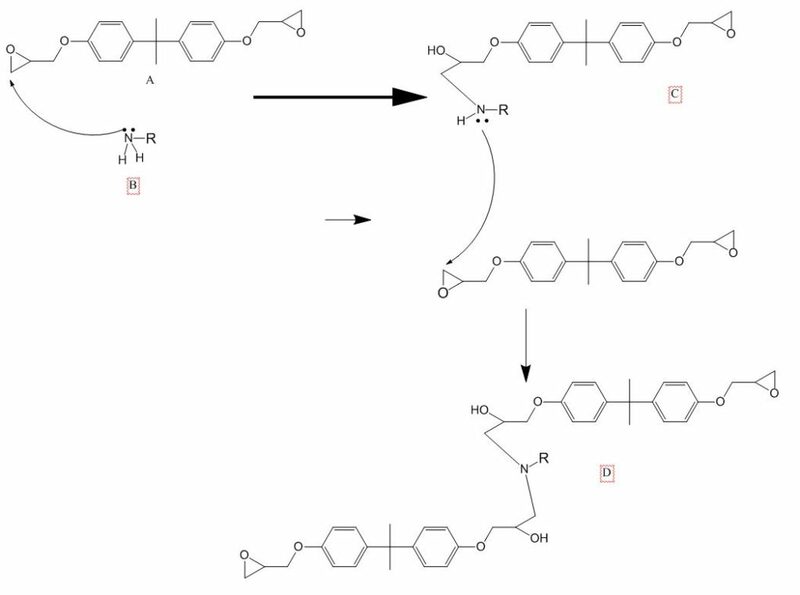 This is what leads to the polymerization or chain forming process. In the schematic below, the hardener contains a primary amine, but it only has one amine per molecule (the -R simply denotes any organic fragment). The primary amine B can react with one molecule of A to give C which contains a secondary amine (a secondary amine will only have one hydrogen atom connected to it). Secondary amines are also capable of reacting with epoxides and will give D in the example below. The problem with secondary amines is that the nitrogen will be more crowded (steric hindrance) and this can slow down its reacting with another molecule of A and slow down the curing process. An interesting point to make with epoxides is that woodworkers often like to darken their epoxy using a dye. And if your dye contains a primary or secondary amine (like an aniline dye) it could actually react with your epoxy resin. This shouldn’t interfere with the properties of your epoxy because only a very small amount of dye is usually used. This entry was posted on Saturday, November 18th, 2017 at 3:02 pm	and is filed under Science, Uncategorized, Wood Chem. You can follow any responses to this entry through the RSS 2.0 feed. You can skip to the end and leave a response. Pinging is currently not allowed. Thanks for the info, Brian. “The structure of epoxy resins and their hardeners are often proprietary and covered by patents.” Ah, that’s why brand X professes to be better than all of the others. I just presumed that all the manufactures would be using the same mixes and ratios by now (patent out of date). Oh yeah. I’m sure a decent amount of research goes into designing epoxies with specific properties. Thanks for checking out the article!